I don't know about your part of the world, but it is super-hot in sunny Southern California. There have been power outages throughout the city, and last night it was my neighborhood's turn. This got me thinking ... what can you do during a power outage ... aside from hoping your food doesn't spoil or you don't melt. As I was waiting for my lights - and air conditioner - to come back on, I came up with this list. I wanted to save the battery on my computer, so I grabbed pen, paper, and my Huglight flashlight. 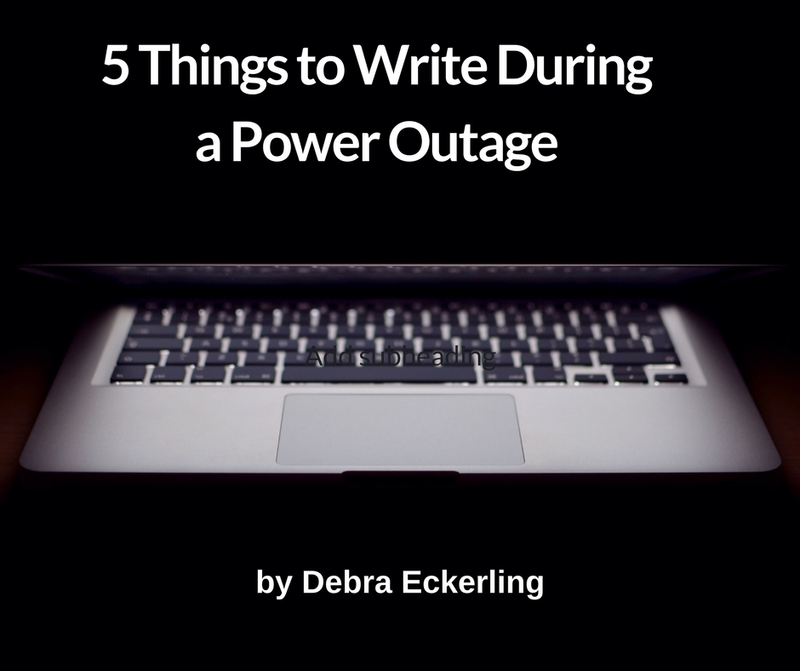 Here are 5 things you can work on when the power goes out. 1. Draft an Article. Whether you're on a deadline or there's a story or essay you've been meaning to write, draft it out on a piece of paper. You can do an extra edit when you transfer it to your computer later on. 2. List Ideas. Let your mind run wild. Brainstorm ideas for upcoming articles, stories, books, screenplays, poems, etc. Or start writing them. 3. Outline a Story. Did you just come up with a fabulous idea for a plot? Write it out in as little or much detail as your want. 4. Work on Character Development. I think the most fun part about writing fiction is creating new characters. Spend some time and really get to know them. 5. Journal. My favorite go-to writing activity is journaling. Get everything - good, bad, fiction, non, ideas, issues, etc. - out of your head and onto the page. Then you can reboot and revisit, or not, at a later date. There are plenty of creative things you can do when you waiting, whether it's for an appointment, standing in line, or for your electricity to come back on. Besides the time passes much more quickly when you are being productive. What do you do when your power goes out? Do you spend it being creative? Please share in the comments. Your article shows how dependent we are on technology and electricity. Thank you for these innovative and excellent ideas. A number of years ago I purchased an Alphasmart 3000 (look it up on ebay). It is old technology and a full-size keyboard that holds many pages of text--and runs on several AA batteries. It is not connected to the Internet or dependent on electricity. I use my Alphasmart on airplanes and many other places. Some of my novel writing friends use their Alphasmart outside to write. 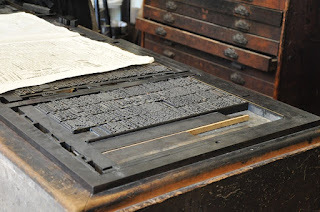 It is a great tool and old technology--easy to use. I recommend people search for it in ebay. I bought mine for $30--then when you get it--use it. Thanks, Terry. Glad you liked my ideas. Thanks for the tech rec. I do, however, really like the pen and paper route for drafts, but it sounds like a great option. Debra, it's summer here in NY and my sister, a couple of towns away, has already had three outages in the last week. Great suggestions on what we can write about when we're left to non-tech strategies. We can also write our writing and marketing plan for the next few weeks. Terry, i just ordered the Alphasmart - under $30 with free shipping. Do I need USB cable to upload the content into your laptop when you have electricity? Thanks, Karen. And thanks for the excellent addition to the things you can write list. How awesome that you purchased Terry's suggestion! I'll have to look it up. When the power went out, I had just finished working on my book (which I did most of Saturday), and was debating between writing this article and chilling out. So the inspiration was in real time. 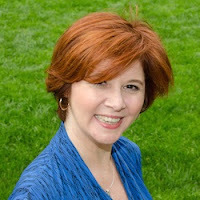 Talk about following marketing's golden rule! That is, tune in to what is current. Yes, the pun is intended. No current, very little marketing! Hugs, C.
Good article. I used to live in southern California, actually born there and moved to Montana in 1994. I don't remember power outages when I was there. There's so many more people now. I enjoyed the article. 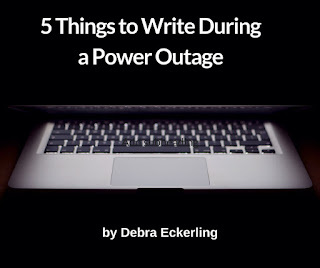 Debra, your ideas are great for anytime--even when the electricity is on! Thanks for the great suggestions! I enjoyed your article. Thanks, Linda. Happy to hear it! Terry, thank you for your suggestion, too. I found Alphasmarts on Amazon and will buy one, especially for when I go to Australia at the end of this year!